Rose Slivka, “The New Ceramic Presence,” Craft Horizons 21, no. 4 (July/August 1961): 31-37. Reproduced with permission of the American Craft Council. AMERICAN ceramics—exuberant, bold, irreverent—has 111 excited admiration and controversy among craftsmen in every field both here and abroad. The most populated, aggressively experimental and mutable area of craft expression, it is symptomatic of the vitality of U.S. crafts with its serious, personal, evocative purposes. As in the other arts, ceramics, also, has broken new ground and challenged past traditions, suggested new meanings and possibilities to old functions and habits of seeing, and has won the startled attention of a world unprepared for the unexpected. 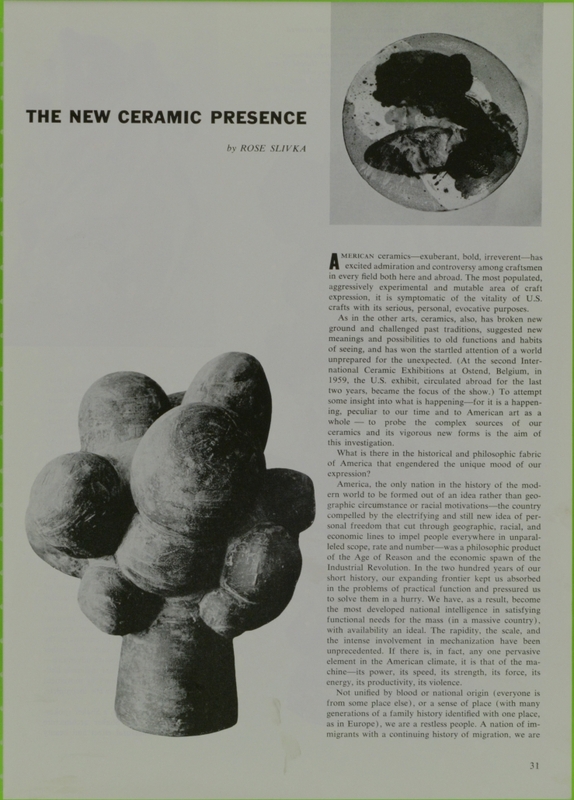 (At the second International Ceramic Exhibitions at Ostend, Belgium, in 1959, the U.S. exhibit, circulated abroad for the last two years, became the focus of the show.) To attempt some insight into what is happening—for it is a happening, peculiar to our time and to American art as a whole — to probe the complex sources of our ceramics and its vigorous new forms is the aim of this investigation. What is there in the historical and philosophic fabric of America that engendered the unique mood of our expression? America, the only nation in the history of the modern world to be formed out of an idea rather than geographic circumstance or racial motivations—the country compelled by the electrifying and still new idea of personal freedom that cut through geographic, racial, and economic lines to impel people everywhere in unparalleled scope, rate and number—was a philosophic product of the Age of Reason and the economic spawn of the Industrial Revolution. In the two hundred years of our short history, our expanding frontier kept us absorbed in the problems of practical function and pressured us to solve them in a hurry. We have, as a result, become the most developed national intelligence in satisfying functional needs for the mass (in a massive country), with availability an ideal. The rapidity, the scale, and the intense involvement in mechanization have been unprecedented. If there is, in fact, any one pervasive element in the American climate, it is that of the machine— its power, its speed, its strength, its force, its energy, its productivity, its violence. Not unified by blood or national origin (everyone is from someplace else), or a sense of place (with many generations of a family history identified with one place, as in Europe), we are a restless people. A nation of immigrants with a continuing history of migration, we are obsessed by the need for arrival—a pursuit that eludes us. And so, we are always on the go. (Our writers—Walt Whitman, Herman Melville, Thomas Wolfe, and, most recently, Jack Kerouac—have struggled for a literary art form to express this.) Having solved our need for mobility by mechanical means, we love engineering and performance and the materials and tools by which we have achieved them. In our involvement with practical matters, we were too busy really to cultivate the idea of beauty. Beauty as such—the classical precepts of harmonious completion, of perfection, of balance—is still a Western European idea, and it is entirely possible that it is not the esthetic urgency of an artist functioning in an American climate—a climate which not only has been infused with the dynamics of machine technology, but with the action of men—ruggedly individual and vernacular men (the pioneer, the cowboy) with a genius for improvisation. Our environment, our temperament, our creative tensions do not seem to encourage the making of beauty as such, but rather the act of beauty as creative adventure— energy at work—tools and materials finding each other—machines in movement —power and speed—always incomplete, always in process. As far back as 1870, a Shaker spokesman declared that Shaker architecture ignored “architectural effect and beauty of design” because what people called “beautiful” was “absurd and abnormal.” * It had been stated by others before and was restated many times since, including the declaration in the 1920’s by famous architect Raymond M. Hood: “This beauty stuff is all the bunk.” ** A typical American attitude, it may well have expressed the beginning of a new American esthetic rather than gross lack of appreciation for the old one. This is the ebullient, unprecedented, environment of the art that, particularly in the fifteen years since World War II, has asserted itself on every level. First manifested in painting—the freest of the arts from the disciplines of material or function—it projected such a presence of energy, new ideas and methods, that it released a chain reaction all over the world, and for the first time we saw the influence of American painting abroad. But nowhere has the impact of contemporary American painting been greater than here at home. Feeding on itself, it has multiplied and grown in vitality and daring to penetrate every field of creative activity. Pottery, of course, has always served as a vehicle for painting, so this in itself is nothing new. The painted pottery of Greece strictly followed the precepts of the painting of the time in style and quality, while that of Japan was often freer and in advance of its other media of painting, even anticipating abstract modern approaches. Contemporary painting, however, has expanded the vocabulary of abstract decoration and given fresh meaning to the accidental effects of dipped, dripped, poured and brushed glazes and slips on the pot in the round. 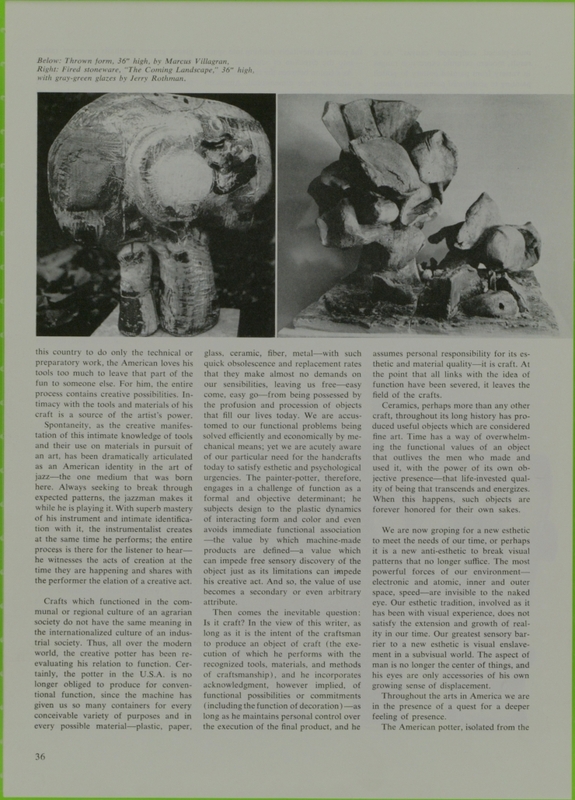 But its greatest and most far-reaching effect in ceramics has been the new emphasis it gave to the excitement of surface qualities—texture, color, form— and to the artistic validity of spontaneous creative events during the actual working process—to everything that happens to the clay while the pot is being made. 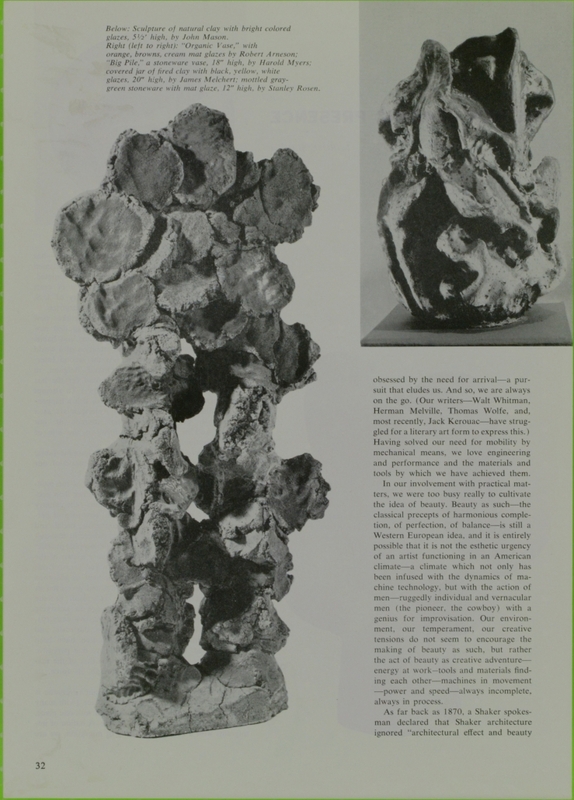 * Clay, perhaps more than any other material, undergoes a fabulous creative transformation—from a palpable substance to a stone-like, self-supporting structure—the self-recorded history of which is burned and frozen into itself by fire. More than in any other form of art, there is a tradition of the “accident” in ceramics—the unpremeditated, fortuitous event that may take place out of the potter’s control, in the interaction between the living forces of clay and fire which may exercise mysterious wills of their own. 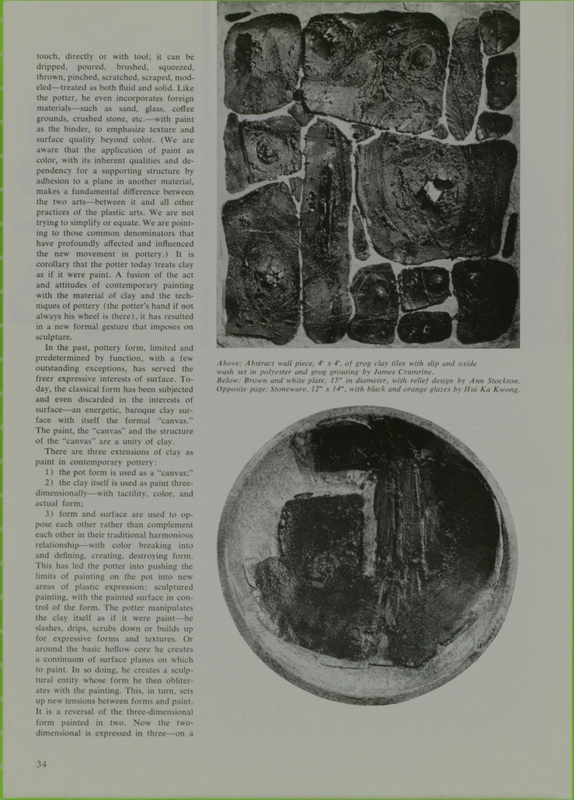 The fact that the validity of the “accident” is a conscious precept in modern painting and sculpture is a vital link between the practice of pottery and the fine arts today. By giving the inherent nature of the material greater freedom to assert its possibilities—possibilities generated by the individual, personal quality of the artist’s specific handling—the artist underscores the multiplicity of life (the life of materials and his own), the events and changes that take place during his creative act. Painting shares with ceramics the joys and the need for spontaneity in which the will to create and the idea culminate and find simultaneous expression in the physical process of the act. Working with a sense of immediacy is natural and necessary to the process of working with clay. It is plastic only when it is wet and it must be worked quickly or it dries, hardens and changes into a rigid material. The painter, moreover, having expanded the vistas of his material, physically treats paint as if it were clay—a soft, wet, viscous substance responsive to the direction and force of the hand and to the touch, directly or with tool; it can be dripped, poured, brushed, squeezed, thrown, pinched, scratched, scraped, modeled— treated as both fluid and solid. Like the potter, he even incorporates foreign materials—such as sand, glass, coffee grounds, crushed stone, etc.—with paint as the binder, to emphasize texture and surface quality beyond color. (We are aware that the application of paint as color, with its inherent qualities and dependency for a supporting structure by adhesion to a plane in another material, makes a fundamental difference between the two arts—between it and all other practices of the plastic arts. We are not trying to simplify or equate. We are pointing to those common denominators that have profoundly affected and influenced the new movement in pottery.) It is corollary that the potter today treats clay as if it were paint. A fusion of the act and attitudes of contemporary painting with the material of clay and the techniques of pottery (the potter’s hand if not always his wheel is there), it has resulted in a new formal gesture that imposes on sculpture. In the past, pottery form, limited and predetermined by function, with a few outstanding exceptions, has served the freer expressive interests of surface. Today, the classical form has been subjected and even discarded in the interests of surface—an energetic, baroque clay surface with itself the formal “canvas.” The paint, the “canvas” and the structure of the “canvas” are a unity of clay. 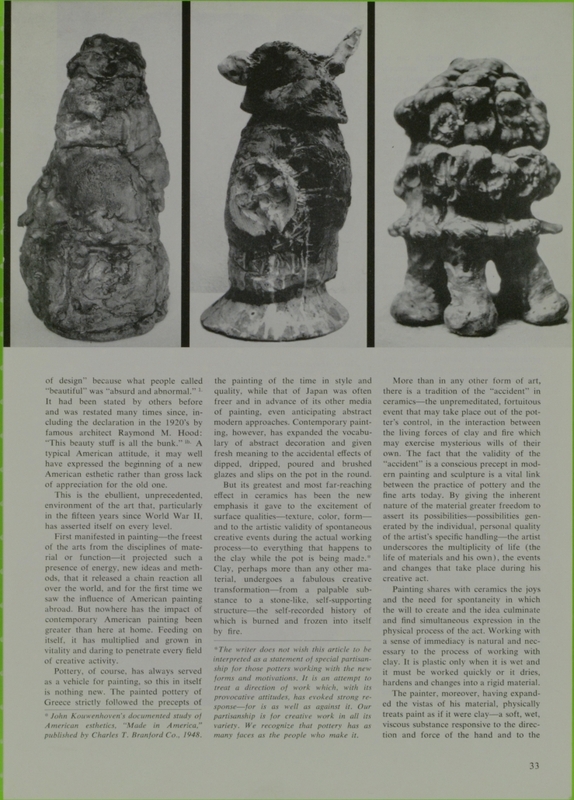 There are three extensions of clay as paint in contemporary pottery: 1) the pot form is used as a “canvas;” 2) the clay itself is used as paint three-dimensionally— with tactility, color, and actual form; 3) form and surface are used to oppose each other rather than complement each other in their traditional harmonious relationship—with color breaking into and defining, creating, destroying form. This has led the potter into pushing the limits of painting on the pot into new areas of plastic expression: sculptured painting, with the painted surface in control of the form. The potter manipulates the clay itself as if it were paint—he slashes, drips, scrubs down or builds up for expressive forms and textures. Or around the basic hollow core he creates a continuum of surface planes on which to paint. In so doing, he creates a sculptural entity whose form he then obliterates with the painting. This, in turn, sets up new tensions between forms and paint. It is a reversal of the three-dimensional form painted in two. Now the two-dimensional is expressed in three—on a multi-planed, sculptured “canvas.” As a result, modern ceramic expression ranges in variety from painted pottery to potted painting to sculptured painting to painted sculpture to potted sculpture to sculptured pottery. And often the distinctions are very thin or non-existent. The current pull of potters into sculpture— in every material and method, including welded metals, cast bronze, plaster, wood, plastics, etc.—is a phenomenon of the last five years. So great a catalyst has been American painting that the odyssey from surface to form has been made through its power. Manipulating form as far as it could go to project the excitement of surface values, the potters found even the slightest concession to function too limiting. From painter-potters, they were impelled to become painter-sculptors. Instead of form serving function, it now serves to develop the possibilities of the new painting. However, while this painting generates the creation of forms for itself—often massive in scale—it tolerates the dominance of no presence other than itself. In his new idea of a formal synthesis, the potter is inevitably pushing into space—into the direction of sculpture. As a fusion between the two dimensional and the three dimensional, American pottery is realizing itself as a distinct art form. In developing its own hybrid expression, it is like a barometer of our esthetic situation. Involvement in the new handling of surface with form, however, cannot rest on traditional categorizing. The lines cross back and forth continuously. While the painter, in building and modeling his surface has reached toward the direction of sculpture, so, too, the sculptor has been independently reaching away from the conventional bounds of sculptural form toward an energy of space and the formal possibilities of an activated surface (with or without color). The hybrid nature of this expression, however, has always been within the realm of sculpture, only to be released as an entity in our time. Sculpture, as every area of the plastic arts, is re-evaluating the very idea that gave it birth—monumentality. A traditional sculptural aspiration, its values, too, have changed. The sculptor today places greater emphasis on event rather than occasion, in the force of movement and the stance of dance rather than in the power of permanence and the weight of immobility, in the metamorphosis of meanings rather than in the eternity of symbols. Specific to the kinship between potter and sculptor is the fact that clay is a primary material for both (for the potter, the sole material; for the sculptor, one of several). Its tools and methods impose many of the same technical skills and attitudes on both. In general, potter and sculptor share a creative involvement in the actuality of material as such—its body and dimension—an experience of the physicality of an object that in scale and shape relates to the physicality of the artist’s own body in a particular space. 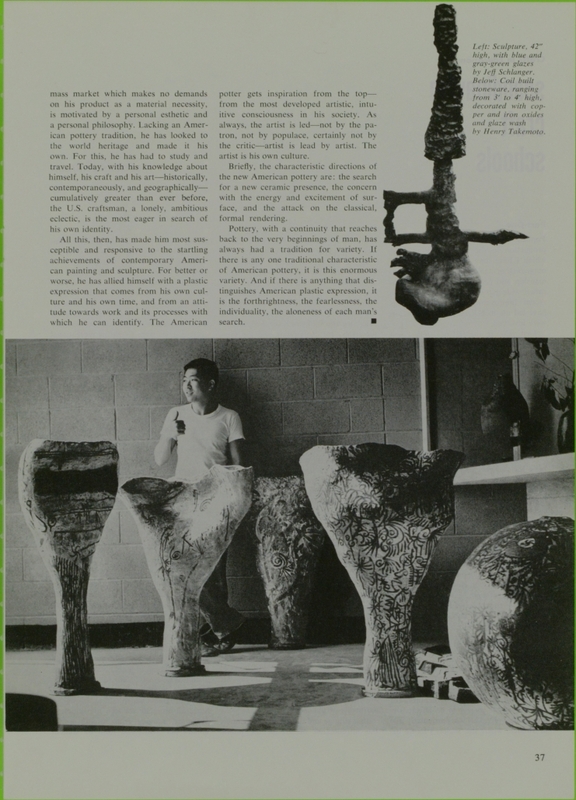 The developments in abstract sculpture have decidedly affected the formal environment of ceramists everywhere. The decision of the sculptor to reinterpret the figure as well as all organic form through abstraction and even to project intellectually devised forms with no objective reference inevitably enlarged the formal vistas of every craftsman and designer working in three dimensions. To pottery, sculpture has communicated its own sense of release from the tyranny of traditional tools and materials, a search for new ways of treating materials and for new forms to express new images and new ideas. 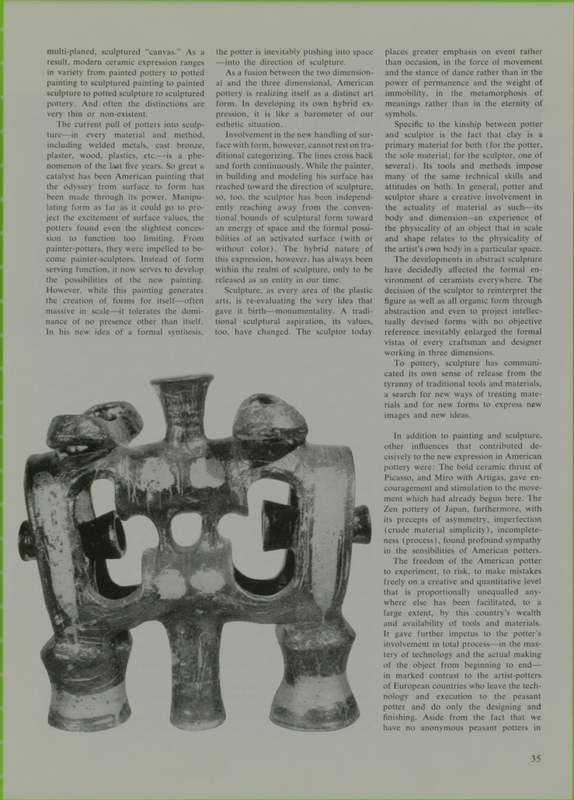 In addition to painting and sculpture, other influences that contributed decisively to the new expression in American pottery were: The bold ceramic thrust of Picasso, and Miro with Artigas, gave encouragement and stimulation to the movement which had already begun here. The Zen pottery of Japan, furthermore, with its precepts of asymmetry, imperfection (crude material simplicity), incomplete-ness (process), found profound sympathy in the sensibilities of American potters. The freedom of the American potter to experiment, to risk, to make mistakes freely on a creative and quantitative level that is proportionally unequalled anywhere else has been facilitated, to a large extent, by this country’s wealth and availability of tools and materials. It gave further impetus to the potter’s involvement in total process—in the mastery of technology and the actual making of the object from beginning to end— in marked contrast to the artist-potters of European countries who leave the technology and execution to the peasant potter and do only the designing and finishing. Aside from the fact that we have no anonymous peasant potters in this country to do only the technical or preparatory work, the American loves his tools too much to leave that part of the fun to someone else. For him, the entire process contains creative possibilities. Intimacy with the tools and materials of his craft is a source of the artist’s power. Spontaneity, as the creative manifestation of this intimate knowledge of tools and their use on materials in pursuit of an art, has been dramatically articulated as an American identity in the art of jazz—the one medium that was born here. Always seeking to break through expected patterns, the jazzman makes it while he is playing it. With superb mastery of his instrument and intimate identification with it, the instrumentalist creates at the same time he performs; the entire process is there for the listener to hear— he witnesses the acts of creation at the time they are happening and shares with the performer the elation of a creative act. Crafts which functioned in the communal or regional culture of an agrarian society do not have the same meaning in the internationalized culture of an industrial society. Thus, all over the modern world, the creative potter has been re-evaluating his relation to function. Certainly, the potter in the U.S.A. is no longer obliged to produce for conventional function, since the machine has given us so many containers for every conceivable variety of purposes and in every possible material—plastic, paper, glass, ceramic, fiber, metal—with such quick obsolescence and replacement rates that they make almost no demands on our sensibilities, leaving us free—easy come, easy go—from being possessed by the profusion and procession of objects that fill our lives today. We are accustomed to our functional problems being solved efficiently and economically by mechanical means; yet we are acutely aware of our particular need for the handcrafts today to satisfy esthetic and psychological urgencies. The painter-potter, therefore, engages in a challenge of function as a formal and objective determinant; he subjects design to the plastic dynamics of interacting form and color and even avoids immediate functional association —the value by which machine-made products are defined—a value which can impede free sensory discovery of the object just as its limitations can impede his creative act. And so, the value of use becomes a secondary or even arbitrary attribute. Then comes the inevitable question: Is it craft? In the view of this writer, as long as it is the intent of the craftsman to produce an object of craft (the execution of which he performs with the recognized tools, materials, and methods of craftsmanship), and he incorporates acknowledgment, however implied, of functional possibilities or commitments (including the function of decoration)—as long as he maintains personal control over the execution of the final product, and he assumes personal responsibility for its esthetic and material quality—it is craft. At the point that all links with the idea of function have been severed, it leaves the field of the crafts. Ceramics, perhaps more than any other craft, throughout its long history has produced useful objects which are considered fine art. Time has a way of overwhelming the functional values of an object that outlives the men who made and used it, with the power of its own objective presence—that life-invested quality of being that transcends and energizes. When this happens, such objects are forever honored for their own sakes. We are now groping for a new esthetic to meet the needs of our time, or perhaps it is a new anti-esthetic to break visual patterns that no longer suffice. The most powerful forces of our environment— electronic and atomic, inner and outer space, speed—are invisible to the naked eye. Our esthetic tradition, involved as it has been with visual experience, does not satisfy the extension and growth of reality in our time. Our greatest sensory barrier to a new esthetic is visual enslavement in a sub-visual world. The aspect of man is no longer the center of things, and his eyes are only accessories of his own growing sense of displacement. Throughout the arts in America we are in the presence of a quest for a deeper feeling of presence. The American potter, isolated from the mass market which makes no demands on his product as a material necessity, is motivated by a personal esthetic and a personal philosophy. Lacking an American pottery tradition, he has looked to the world heritage and made it his own. For this, he has had to study and travel. Today, with his knowledge about himself, his craft and his art—historically, contemporaneously, and geographically— cumulatively greater than ever before, the U.S. craftsman, a lonely, ambitious eclectic, is the most eager in search of his own identity. All this, then, has made him most susceptible and responsive to the startling achievements of contemporary American painting and sculpture. For better or worse, he has allied himself with a plastic expression that comes from his own culture and his own time, and from an attitude towards work and its processes with which he can identify. The American potter gets inspiration from the top— from the most developed artistic, intuitive consciousness in his society. As always, the artist is led—not by the patron, not by populace, certainly not by the critic—artist is led by artist. The artist is his own culture. Briefly, the characteristic directions of the new American pottery are: the search for a new ceramic presence, the concern with the energy and excitement of surface, and the attack on the classical, formal rendering. * John Kouwenhoven’s documented study of American esthetics, “Made in America,” published by Charles T. Branford Co., 1948.